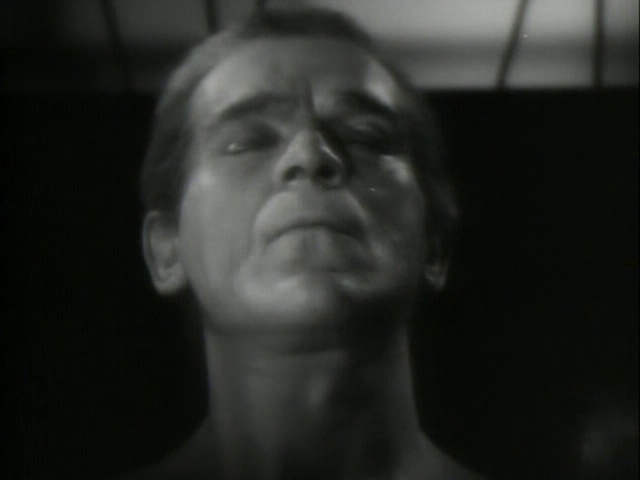 A pianist (Boris Karloff) falsely accused of murdering a judge (Joe King) is electrocuted, but brought back to life by a scientist (Edmund Gwenn), after which he proceeds to haunt the men who framed him. 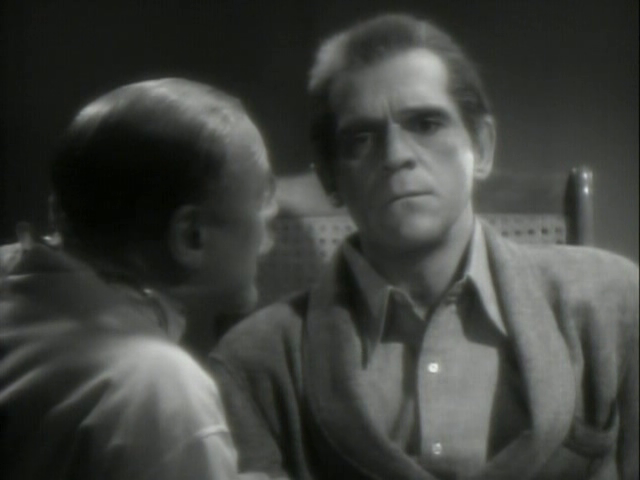 After his breakthrough role as the Monster in Frankenstein (1931), Boris Karloff was involved in no less than seven other films involving mad scientists and/or living corpses; five of these — Before I Hang (1940), Black Friday (1940), The Devil Commands (1941), The Man They Could Not Hang (1939), and this title — are listed in Peary’s book. 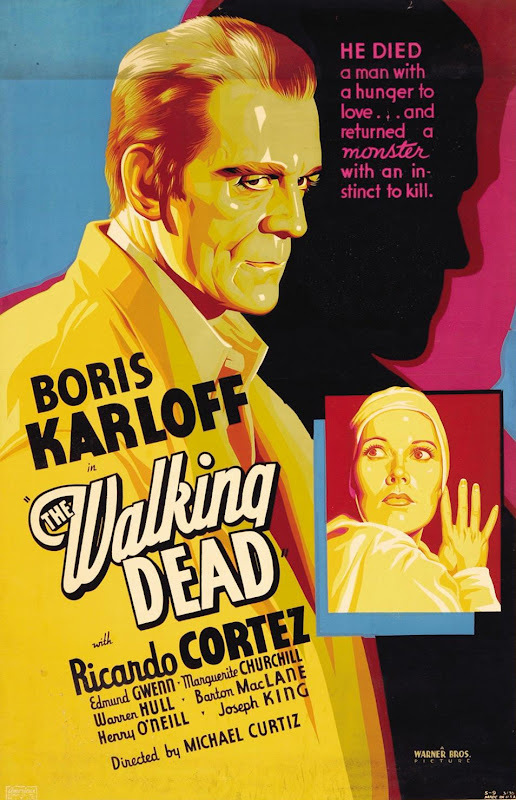 The Walking Dead seems perhaps most closely aligned with Frankenstein‘s sensibilities, given that Karloff’s post-death make-up (though much more muted) pays explicit homage to that of his fabled Monster, and the resurrection scene hearkens back strongly to its classic predecessor, with Dr. Beaumont (Edmund Gwenn) actually stating in awe, “He’s alive!” Given the enormous popularity of Frankenstein (and Universal Studios’ eagerness to bank upon its successes), these thematic connections are not all that surprising — nor, sadly, is the fact that The Walking Dead pales in comparison. The film’s primary problem lies in its underdeveloped narrative and characters. There’s a weak attempt at a romantic subplot between Gwenn’s over-worked assistants (played by Marguerite Churchill and Warren Hull), but this goes absolutely nowhere; and speaking of Gwenn, his “mad doctor” is frustratingly opaque. It’s difficult to think of Gwenn as anything other than a jolly do-gooder, yet here he blithely fools around with a man’s existence to fulfill his own curiosities about death — all the same, we’re left unsatisfied in terms of knowing how exactly we’re meant to react to him and his motivations. Karloff, however, is fine from beginning to end — as with his Monster, he injects his troubled protagonist here with extraordinary pathos throughout. Meanwhile, director Michael Curtiz and DP Hal Mohr do a fine job playing up the atmospheric nature of the screenplay, which cleverly incorporates gangster elements into its storyline; Ricardo Cortez as the lead gangster responsible for boldly sending Karloff to the electric chair is particularly well cast. First viewing. A once-must, as a unique blend of Universal horror with Warner Bros. crime drama. Clearly WB saw what ‘Frankenstein’ brought to the box office for one of its competitors and saw an opportunity to cash in for its own studio. The assessment given points out certain strengths in this film – even though (agreed) it’s not up to the standards of ‘Frankenstein’ (which takes more time developing its story details). With what it has working in its favor, however, it’s effective-enough on its own and, with Curtiz turning in his dependable-as-usual work as director, the result is a rather gripping 65 minutes that seem to fly by – esp. in the last 20 minutes, when the unexplained (and left that way) supernatural factor kicks in. 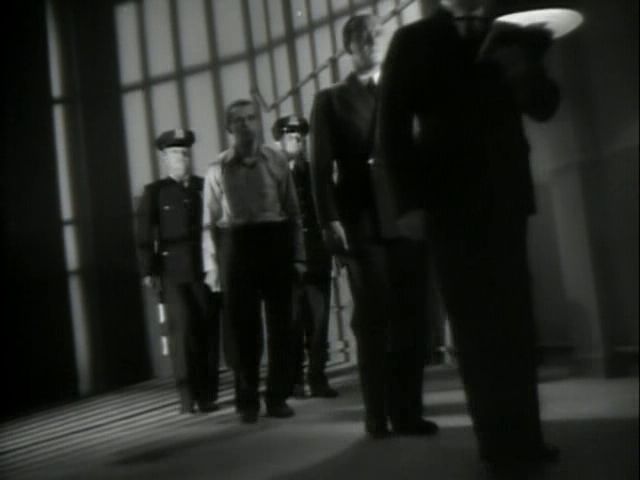 The film also has an interesting noir element (long before noir came into vogue), as it largely deals with an innocent man whose fate is sealed. All told, a satisfying flick.